Dogs, Vampires and Screams, Oh My! Are you caging yourself or being caged? The second half of The Energy Bus, by Jon Gordon gives us some great food for thought. I enjoy the metaphors sprinkled throughout the book, because they help to create a visual that can act as cues to remind us of when shifting our energy (or removing ourselves from negative environments) is essential. Since Halloween is drawing near, I decided that I would use the months of September and October to practice ridding my inner and outer surroundings of the “negative dogs” and the “energy vampires.” By the time October 31st comes around I’ll be ready to celebrate the success of this challenge. Truth be told, however, we don’t need an occasion like Halloween to practice these techniques. The dogs and vampires surround us daily, and relinquishing them of their power on a daily basis is where the mastery lies. So, what’s all this dog talk? Here’s the story from The Energy Bus. 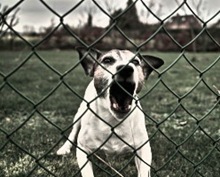 We all have those voices inside barking at us all day. Which one is more productive and energy building, and which one makes us foam at the mouth (practically!) and sends people running in the other direction? I bet I don’t have to answer the question. It’s kind of scary to see yourself as a dog on attack, but many times that’s exactly how we act toward ourselves and others. Yikes! So, let’s heed the wise man’s advice and FEED THE POSITIVE DOG! I never thought of these “energy suckers” as vampires before, but the visual is very powerful. We all know who these people are, don’t we? Sometimes we call them Debbie Downers, or Sore Losers, Wet Towels, Buzz Kills, etc. Humorous, yes, but true. When we are in our “flow” and feeling great, one of these vampires comes along and drains us of our energy through his/her complaints, accusations, depression, etc. Sometimes, we are the vampires. Yes, looking in the mirror often can be enlightening. We all have a shadow side and many of the things we see in others that make us feel uncomfortable are the very things we do to others unconsciously. So, how do we not become the negative dog or energy vampires, and how do we avoid getting the energy sucked out of us from other negative dogs and energy vampires? Yes, folks, it all starts with us. 6. Post a Sign That Says No Energy Vampires Allowed on Your Bus. That’s right, just don’t let them in! Tell them to stay away. And, if you are the vampire, you’ve got some work to do. 7. Enthusiasm Attracts More Passengers and Energizes Them During the Ride. Do you want to be on the Debbie Downer bus or the Bob the Builder bus? 8. Love Your Passengers. The heart acts as an emotional conductor and radiates how you are feeling to every cell in the body via the heart’s electromagnetic field; this energy field can be detected up to 5 to 10 feet away. What are you attracting? Do you want to attract love or fear? 9. Drive with Purpose. If you don’t know where you’re going, how will you get to where you need to go? 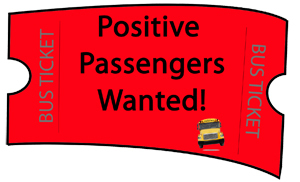 Drive your bus with purpose daily and more people will come along for the ride. 10. Have Fun and Enjoy the Ride. In the end, isn’t this what life’s all about? More and more, what matters to me is enjoying the process, not the end result. Finding joy and living energetically in the moment can provide us with millions of meaningful moments along our journey. While common sensical, The Energy Bus provides us a story that we can relate to. We encounter individuals on a daily basis who have either given up, or who are fighting way too hard. Sometimes, we, ourselves, are those people. Author, Jon Gordon, gives us 10 simple steps to gain more control of our lives, raise our energy, live with heart, and allow the flow of life to bring us joy again. We can choose to be energetic and happy. The choice always begins with us. Halloween doesn’t need to be every day. That’s really scary! Let’s get rid of those nasty dogs and vampires and get a move on! « It’s Your Bus; Drive It!